Each spring we have found one, sometimes two individuals of eastern milk snake, Lampropeltis triangulum, in our "snake hotel" in our biodiversity garden. We find this snake in the same sunny area of our garden, where there is an old rock pile left by the previous owners of our home. Realizing the snakes prefer this rock pile, we've kept it and named it our snake hotel. Eastern milk snake is a beautiful animal, harmless to humans, and an essential component of our environment as it consumes small rodents and keeps their populations in check. The milk snake is listed as Special Concern under the Ontario Endangered Species Act. 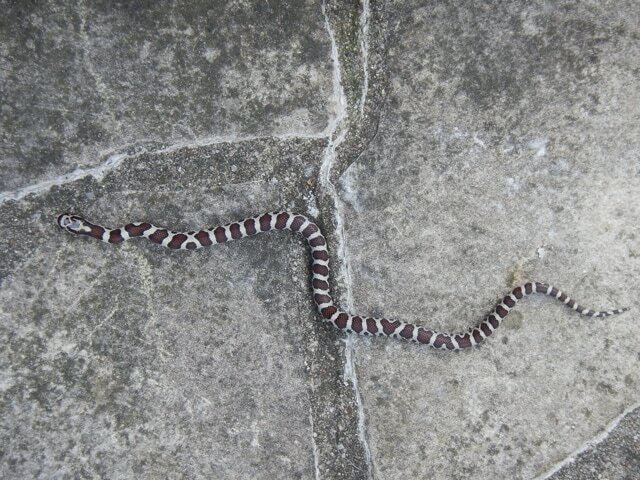 Read more about the current status of the milk snake on the website of Ontario Nature.